Description: The very first Snoopy Sniffer was introduced in 1938 as the #180 Snoopy Sniffer. The second Snoopy Sniffer was introduced in 1955 as the #780 Snoopy Sniffer. The third and final Snoopy Sniffer was introduced in 1961 as the #181 Snoopy Sniffer, remaining in production until 1980. Many generations of children have played with the faithful and loyal Snoopy Sniffer, thus making him one of the most popular pull toys that Fisher-Price has ever made. 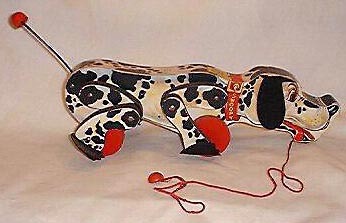 FPT4397 - Wooden cut-out dog with paper lithographs on all sides of a white hound dog with black spots and a red collar marked "SNOOPY" in yellow. 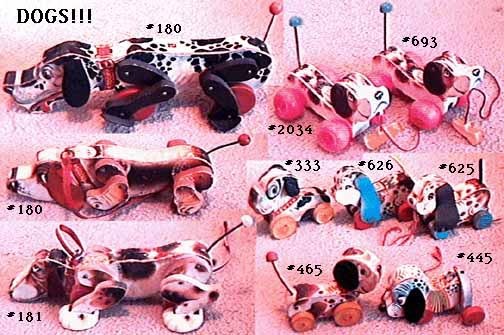 The dog has wooden cut-out double jointed legs with paper lithographs on the sides of white legs with black spots. The dog has black vinyl paws, black vinyl ears, and a coil spring tail with a red bead on end. When pulled, Snoopy makes a "woof-woof" sound, moves all 4 feet, and his spring tail wiggles. Has a yellow tag on the back of his neck marked "Fisher-Price Toys". Measures 13-1/2" long, 4-1/2" high, 6" wide. Also see 1938-1955 & 1958-1961 #180 Snoopy Sniffer. Also see 1961-1980's #181 Snoopy Sniffer.